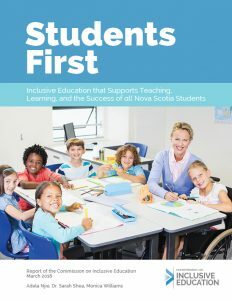 This final report of the Commission on Inclusive Education is the culmination of a year of study, research, public consultation, and ongoing dialogue with Nova Scotians. The commission was tasked with improving inclusive education for the benefit of all Nova Scotia students. We have done that by putting students first. We are pleased to share our final report with you.